Mark Johnston's Jungle Cat made a valiant bid to make all in the historic Group Two and Silvestre de Sousa was in no mood to be passed as the challengers loomed. As Jungle Cat was joined by Muhaarar (7-1) on one side and Ahlan Emarati on the other, it looked like he might be swallowed up, but it was only in the last stride that Paul Hanagan's mount put his head in front. A nose was the official winning margin for the Charlie Hills-trained son of Oasis Dream. Royal Ascot winner Baitha Alga was a disappointment as the writing was on the wall for him from some way out. Hanagan said: "He knuckled down well, he really put his head down for me and is really genuine. "I thought it was a really good run last time (third to Kodi Bear at Ascot), and Charlie was very confident coming into the race. "It's good to get a winner. I had my heart broken on Thursday (with Taghrooda), but as long as she is safe and sound that's the main thing." Hanagan also has the highly regarded pair Estidkhaar and Faydhan to look forward to among his juvenile rides for the rest of this year, and he added: "This lad would be right up there with them." Hills said: "This is our third winner of the week, so it's been good. He's always shown potential and we tried to stretch him over seven furlongs last time. He's growing up now. He's in all the top-class races and I think the Middle Park Stakes will be his primary aim." Charlie Johnston, assistant to his father, said of Jungle Cat: "I'm gutted for him, he's been to all the big meetings and been placed at them all and just got touched off today. "He's been softened up by the others and then caught on the line. We can't be disappointed. 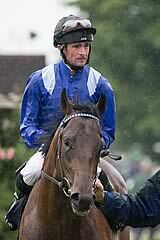 He's in the Mill Reef Stakes and Middle Park and will run in one or the other or maybe both." 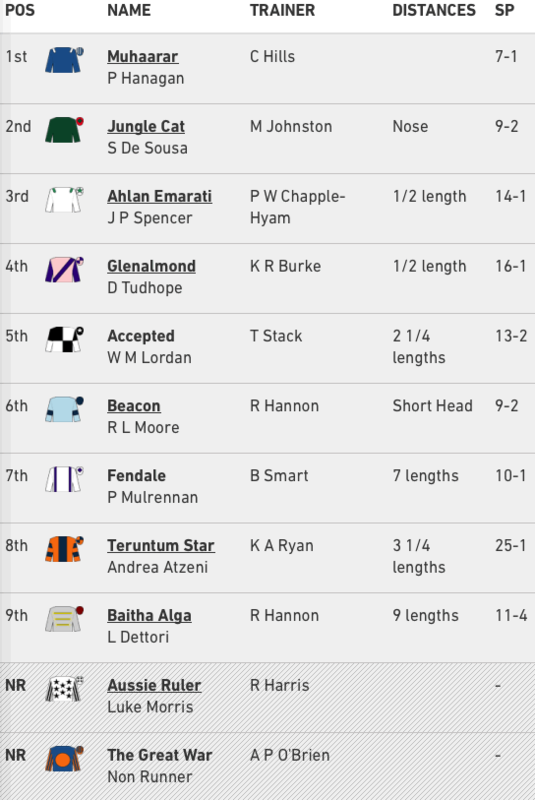 Frankie Dettori, rider of the unplaced favourite Baitha Alga, said: "He was sweating before the race and was too fresh. He wasn't himself today. He also put his foot in a hole."